Do you get frustrated over the expense to buy Oki C710-dn toner at the moment? Luckily, here at Cartridge Save, you'll pay considerably less to get toners than any other store. At the same time, we strictly test and validate every last one of our Oki C710-dn cartridge to be certain that you get total customer satisfaction. Now you can forget paying costly high street pricing because we will offer you a more affordable alternative. Settling for a low quality Oki C710dn toner cartridge is never advisable. Because of our no quibble cash back guarantee on toners you don't need to take any risks. We'll offer you a complete refund in the event that your Oki C710dn toner cartridge fails to meet perform reliably. Order today from Cartridge Save and start to save! 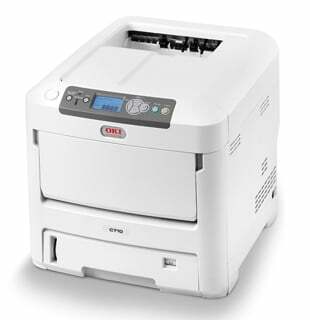 The Oki C710dn colour LED laser printer is a flexible and speedy device designed to be shared by workgroups. The C710dn Oki printer comes with a standard duplexer and network-ready solutions for ease of use and to help users save time, but it is not the best choice for printing photographs. Meanwhile, the four consumables that the Oki C710dn requires are logistically unusual for some users. A linear engine is integrated into this cube-shaped Oki C710dn printer, so individual toner cartridges and four drums are positioned right behind the other. The drums use high-resolution LED illumination that eliminates laser mechanism, but the entire device is still bulky, measuring 17.1 inches wide, 15.3 inches tall, and 23.9 inches deep, while weighing 27.5kg. The front panel's centrepiece is a monochrome bitmapped 4-line, 16-character display with a backlight. The main tray assigned to the Oki C-710dn is a 550-sheet capacity tray, which is in the lower part of the printer. A 100-sheet multi-purpose feed is located in front, hidden behind the pull-down shelf. The Oki C710dn can handle HD colour printing and it can be shared by a small network without affecting print speeds (30ppm in monochrome and 32ppm in colour). The C710dn printer is quite versatile in paper handling, enabling users to print on banners and small cards. Text documents look good because of the 1200x600dpi resolution. Security features for password protection and data encryption can be integrated into the Oki C710dn with the optional hard disk drive. Installing the Oki C710dn LED printer can be a problem because of the unintuitive software that cannot find or detect the drivers. The company does not say if the device is compatible with UNIX or Linux operating systems. The control panel of the Oki C710dn colour laser printer has minimal buttons, but their arrangement is quite overwhelming for first-time users.